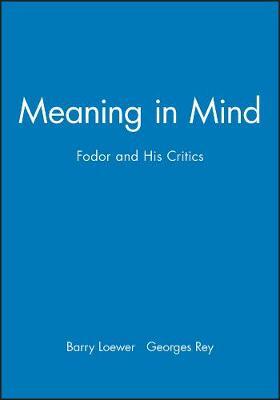 Even in the eyes of many of his critics, Fodor is widely regarded as the most important philosopher of psychology of his generation. With Noam Chomsky at MIT in the 1960s he mounted a strenuous attack on the behaviourism that then dominated psychology and most philosophy of mind, and since then, he has articulated and defended in considerable richness and detail a computational theory of intentional causation that is central to the emerging cognitive sciences. This theory provides a framework both for the resolution of many traditional problems in the philosophy of mind and language, and for actual psychological research and experimentation. The present volume contains 16 contributions by philosophers and cognitive scientists who have been critical of this theory, followed by replies Fodor makes to each of them. There is alos a lengthy introduction that provides an overview of Fodor's views and their relation to this critical discussion.